← Is a Rally for Transit on Tuesday a Rally for YOU, the Muni Owner/Rider, or a Rally for Something Else? 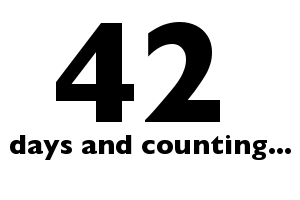 42 Days and Counting: That Challenge to Muni Management and More! A while back I issued a semi-serious, but also semi-satirical challenge to the management of the MTA to actually ride Muni for a month, as a way of illustrating how the latest round of service cuts (or if you speak bureaucrat, “service enhancements”) are starting to stack up and make Muni less of an option for many people. It’s been 42 days now since that post and predictably, there is silence from Muni. Big surprise, I know. If you tried to take a Muni Metro train during say, Pride Sunday, you KNOW what a mess it was. That+Giants Game+Usual Sunday Fun = no one getting around anywhere fast. So again, for fun, I shall updated these at random and see how we go. We know the Mayor can’t really rely on Muni, since it doesn’t go out of town to all those places he’s campaigning for Lt. Governor, and it’s not like he would know how to pay for a bus fare or anything since Muni is not on Planet Gavin. As for the Board….well…let’s not go there. I’m adding a new countdown as well…the number of days it takes to find out when the new bus shelters on Irving will be installed and the story behind what looks like two new parking spaces where the N stop at 9th and Irving is. I’ve emailed folks as of June 23rd and have yet to hear back. I made the mistake of trying 311 on Twitter, where the response first was “call 311” and then “we don’t know.” So why tell me to call 311? Seems kind of silly, yes? Anyway to illustrate my question re: parking, here’s a photo of said spots. Notice how while they would do a nice job of blocking speeding cars who think Irving is a 4 lane highway and seem to be eager to run down pedestrians, said spots would also be blocking people getting on the N at the stop too. And there are no meters. So are they “real” legal parking spots or what? 6 Responses to 42 Days and Counting: That Challenge to Muni Management and More! Regarding those two spots — those aren’t new parking spots, that’s where two parking spots used to be before they built the curb-outs. They just haven’t cleaned up the paint lines. Look down the street; all the divider lines go out into the lane. Granted, I’ve seen cars parked here, when they shouldn’t be, after the curb-outs were added, and it’s ridiculous. I’m hoping the city paints the curb red and gets rid of those lines soon. @Jason: that’s what I just assumed, since it would make no sense – the point of the bulb out was to make crossing the street and boarding Muni easier, and like you note, it’s not like that anywhere else. But until they eliminate the lines people will park there but I would be worried about getting a ticket. The only thing is it DOES keep people from making a hasty right turn. So many drivers just barrel through pedestrian traffic. Not to mention the people who don’t understand the rules of the road for left turns and just make them, even with oncoming traffic! Crazy! “speeding cars who think Irving is a 4 lane highway and seem to be eager to run down pedestrians” + “So many drivers just barrel through pedestrian traffic” – It amazes me that we both live and work near the same intersection. I might use the words “congested” and “awkward” to describe the traffic at 9th & Irving, but I am honestly unfamiliar with this seeming death-trap by my front door. Perhaps the rhetoric is a bit overdone, but it makes for a good blog post. But seriously, many many drivers seem to think that Irving is a 4 lane road because of the N.
Watch cars as they navigate the stretch by the Irving/9th stop. Many drivers think the N is a Left Turn Only Lane, and try to cram their way past the N (despite the stickers) and come close to running over departing N riders. Or, they shove their way around to make a right turn, and the moment the light turns green, they’re hitting the gas, not even bothering to look at pedestrians. As for people on Irving making a left onto 9th? Hah. These people seem to think that the rule is “make the left turn, and forget about oncoming traffic” and this causes many a “FU”. When I first moved back to SF and was driving (!) even I fell victim to this because driving down Irving it’s easy to think that the N is one lane and cars are in another. Out of town guests of mine also fall into this trap until I show them otherwise. Part of it is that the signage and striping may be confusing, and part of it is that many drivers simply no longer obey basic rules of the road. One solution would be to teach drivers to make 270-rights instead of 90-lefts. I got into that habit as a courtesy to my fellow drivers when I saw the bunch-ups that resulted from 90-lefts. 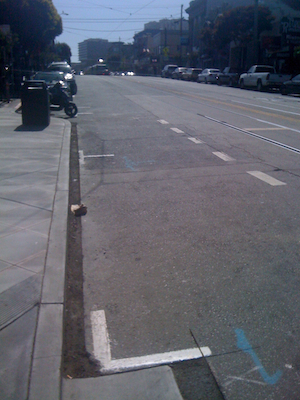 Then there was the Turkey Friday that I got hit by a driver turning left off of Guerrero. My car was a mess as a result. @Ted: excellent point – something I used to do myself. Part of the problem is many drivers who hail from the suburbs originally (or just don’t know how to drive in the City) don’t understand how to look for parking. They will fixate on the first open space closest to their destination, and do those illegal U turns crossing 3 streets or block traffic while they show off their lack of parallel parking skills. I never had much of a problem finding parking, even when I drove a bigger car AND would visit nob hill quite a bit. You just have to be willing to walk a block or two, and to pay attention to the flow of the neighborhood, and parking isn’t that difficult unless you’re parking somewhere that has some huge event.